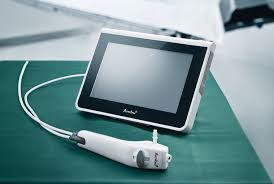 For more information refer to the Ambu aScope User Guide and QuickGuide Bedside Bronchoscopy. Bendigo ICU has single-use scopes for all bronchoscopy (Ambu®aScope 3). There are three sizes, Slim (3.8/1.2), Regular (5.0/2.2) and Large (5.8/2.8). (External diameter (mm)/Channel width (mm)). The monitor has an internal battery with minimum ​3 hour continuous running time when fully charged. Connect blue arrow on scope to blue port on monitor. Turn on – hold on/off button on top right of monitor for one second. The device will be ready for use in around one minute. Turn off – hold on/off button for two seconds. When using lubricant, use gauze to smear along the length of scope, to prevent smearing on the camera. It should not fog due to the heat of the lamp. Tip: Take a still photo of the patient’s BRADMA label either before or after bronchoscopy for easier identification of the images. Still images can be taken whilst video is being recorded. Do not double click on the screen image whilst recording (‘Image extend’), as this will terminate the recording and commence a new one. Saved under ‘All Users’ – a new folder is automatically created when device turned on and all images will be saved to that folder. Images can be transferred to a USB. Use V-wipes to clean the monitor and cords. To prevent moisture entering the monitor ports, ensure that the wipe is not too wet and use a dry cloth/towel to remove any excessive moisture after wiping. The monitor is found in the General Equipment store beside the transport monitors. The scopes are in the respiratory equipment store along the corridor with the consultant offices.